Authentic Japanese matcha whisk; Mixing your Matcha into a fine froth. Help to add that traditional froth to the top of your drink; Traditional bamboo design; A great addition to any matcha set. 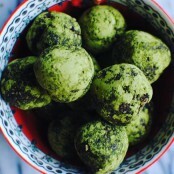 Two things are crucial when it comes to preparing Matcha, the quality of the matcha powder and the choice of whisk or ‘chasen’ for mixing the matcha to the fine airy froth. This traditional Japanese matcha whisk has been crafted from high quality bamboo: the prongs have been cut by hand and the timeless design is minimalist and efficient. Matcha latte's ... the perfect way to get a daily dose of this magic earthy green stuff.